Syrinx is a water nymph who transformed herself into a reed to escape the amorous advances of the god Pan. 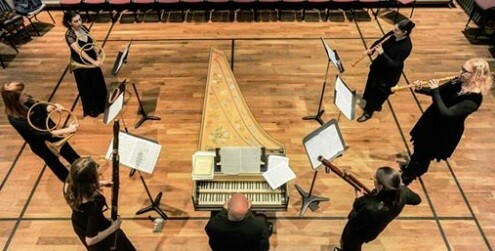 Syrinx is an ensemble dedicated to the performance of historical wind music. From 14th to 18th centuries wind music could be heard everywhere from grand state occasions to the humblest village dance and it is the group’s aim to recreate this impressive tradition. Their repertoire covers the rise of the professional wind band; they perform music from Dufay and Josquin to Handel and Mozart on shawms, dulcians, oboes and bassoons. They have just recorded their first CD The Saxon Alternative, released by Resonus Classics. Telemann’s wind music reveals a fascinating mix of styles; perfectly balanced baroque dances and full-blown orchestral overtures rub shoulders with the rustic miniature of Les Paysans and the gentle snoring of muted double-reeds in Le Someil. The oboe and horn ensemble was a new phenomenon when Telemann was writing this music and he takes full advantage of the opportunity to experiment with these news sounds—predictably milking the horn calls for all they are worth in riotous final Gigue of TWV 44:14, but also throwing up the unusual and very beautiful combination of solo horn and oboe d’amore in the serene, Venetian Siciliano of TWV 44:2. Members of the group can be heard playing in many of the world’s leading period orchestras including the Academy of Ancient Music, The Orchestra of the Age of Enlightenment, La Stagione Frankfurt, Akademie für Alte Musik Berlin, Concerto Köln, The Sixteen and the Australian Chamber Orchestra. On a smaller scale they are also active as chamber musicians, appearing with I Fagiolini, Mediva, Les Haulz et les Bas, Blondel, Mandragora, Apollo & Pan, Il Bacio and Concentus VII.